2015 is the International Year of Light and Light-based Technologies, and we should not keep X and gamma rays out of the party. Contrary to popular belief, light, at least from the physicist’s view, is much more than just the electromagnetic radiation that we see directly with our eyes. But even if we accept that light is the agent making objects visible, how could we deny a “VIP” pass to the party to the rays discovered by Roentgen in 1895? We should not forget that thanks to his X-rays we have managed to see beyond the visible surface of objects. 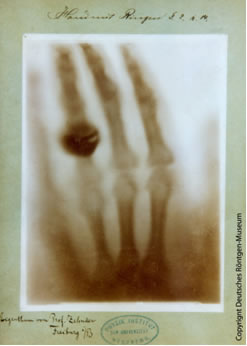 First recorded radiography. The hand of Röntgen’s wife, Anna Bertha Röntgen. Our eyes are not prepared to directly perceive the image formed by X rays when they penetrate the objects. But it did not take us long to manufacture devices capable of recording these images – which are modelled by the differences of electronic densities inside them – and making them accessible to our vision. Thanks to these devices, X rays have shed much more light to the anatomy and pathology of bodies than centuries watching corpses in anatomy lessons; and since their discovery, they opened a world of possibilities that seems endless still today. But it is not only the image that matters. X and gamma rays, and all the family of ionizing radiations that came after, also brought light to the hope of many oncology patients that until then only had one alternative, surgery, to deal with their illness. Even if the scalpel continues to be the most important tool in this battle, the use of this very energetic light is increasingly important in oncology treatments. It is estimated that they are part of the treatment in more than 50% of the total cases. Of all the patients that eventually heal, 40% of them will have received radiation therapy as part of their treatment, and it is considered that radiation therapy is responsible for at least 20% of the healings. Furthermore, it is expected that these figures will increase with the introduction of more advanced radiation techniques which are enabling to apply radiation therapy in locations that were hitherto unattainable because of the high risk of secondary effects. Nor is it just technology. This light, invisible and penetrant, has been the basis for a revolution in medicine, a revolution that has exceeded technology for diagnosis and therapy. In the last century, since the advent of radiology, medicine has increasingly benefited of more contributions from the fundamental sciences, especially physics. This interplay has turned medicine into a more scientific discipline than ever expected. Both in radiation therapy and radiology imaging, the instrumental methods, mathematical models and computation are an indispensable part of the process. The measurement of the radiation fields and their precise characterization is the key to a successful therapy, but it is also the key for imaging quality and the assessment and control of the associated risks. Computational models allow us to extend direct experimental knowledge to situations in which it is impossible to have it, for example, the organism of a patient in treatment. 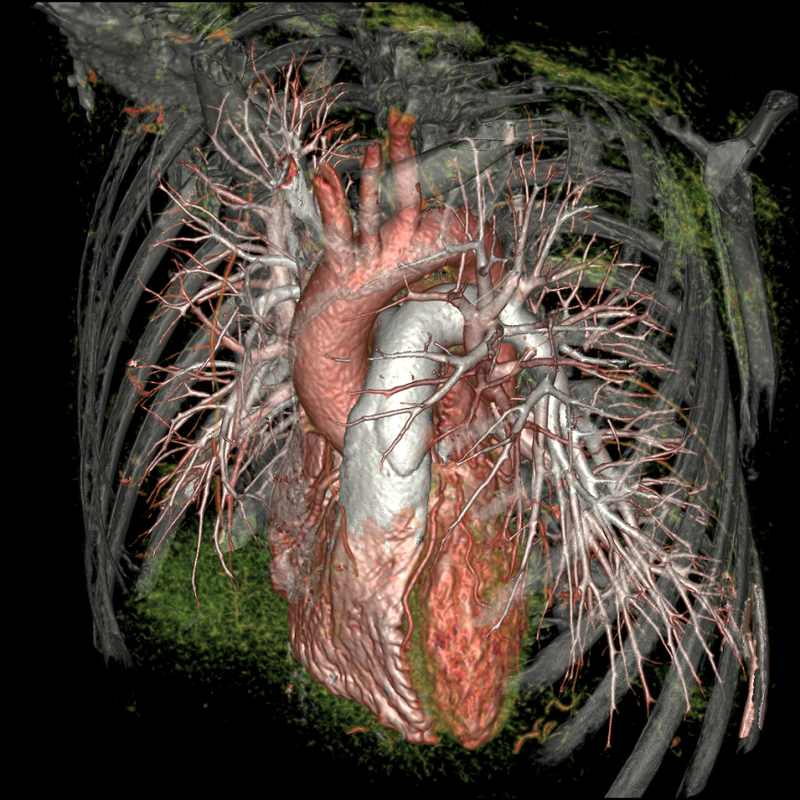 Computation systems (which are among the most powerful tool you can find in a hospital) are essential to perform these calculations and also others related to the creation of a 3D image of a patient from a huge number of transmission measurements. Besides all these models and techniques have later found applications in other fields of medicine apart from radiology. New treatment units have allowed to treat anatomical regions until now unreachables, with high success rates. This fact will result in an increased impact of radiotherapy in the clinical management of cancer. Credit: desayunoconfotones.org. 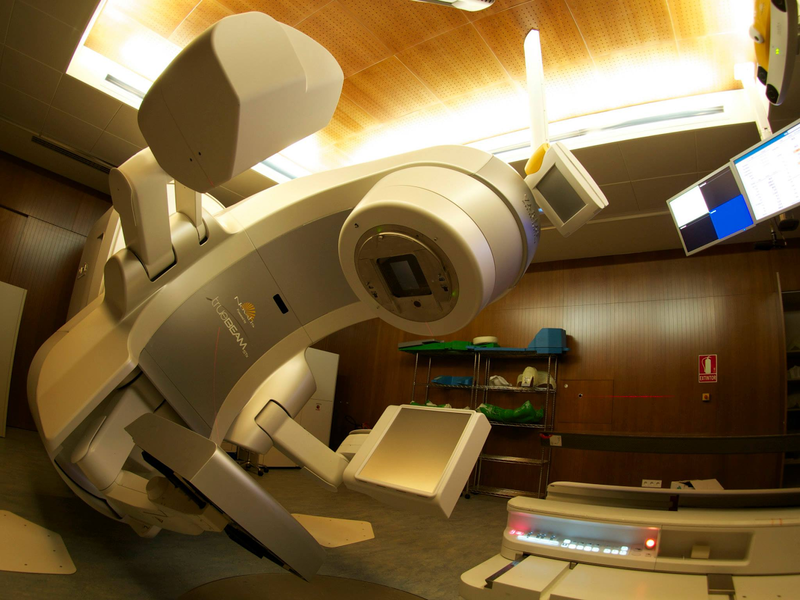 Moreover, because of the increasing complexity of medical applications of ionizing radiation and their potential risks, quality structures and systems have been introduced as routine activities in the health system. Since the beginning, the use of ionizing radiations for diagnosis and therapy has been accompanied by a more and more precise knowledge of their risks. As a result, a tremendous conceptual framework and a security praxis have been developed. This has given rise to the creation of both national and international scientific organizations, as well as the development of a protection system that – of course, with timely updates made in light of new knowledge – still remains in force. Perhaps this last light, after all, won’t be the most important contribution of ionizing radiations to the medical activity. We can’t forget how many lives they save or have helped to save. However, once the long-awaited discovery of a definitive and radical cancer treatment arrives, the day when radiation will not be needed to cure cancer anymore or even to see into the tissues, we are certain that this light, the same light that science brings to all activities of mankind, will never turn off for medicine. It will be thanks to X-rays. Gaspar Sanchez studied Physics at the University of Granada. He worked briefly as high school teacher before beginning his career as a medical physicist. At the moment he is working at the Araba University Hospital in radiotherapy and nuclear medicine. 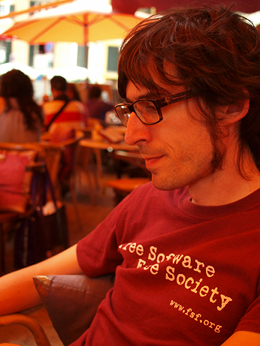 He is co-editor of the blog desayunoconfotones.org, which regularly publishes entries about medical physics, radiotherapy and oncology with interest for the general public. 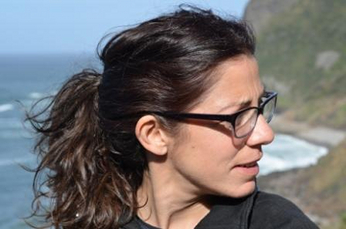 He is also coordinator (with Inés Garmendia) of the spanish edition of the international scientific festival Pint of Science. 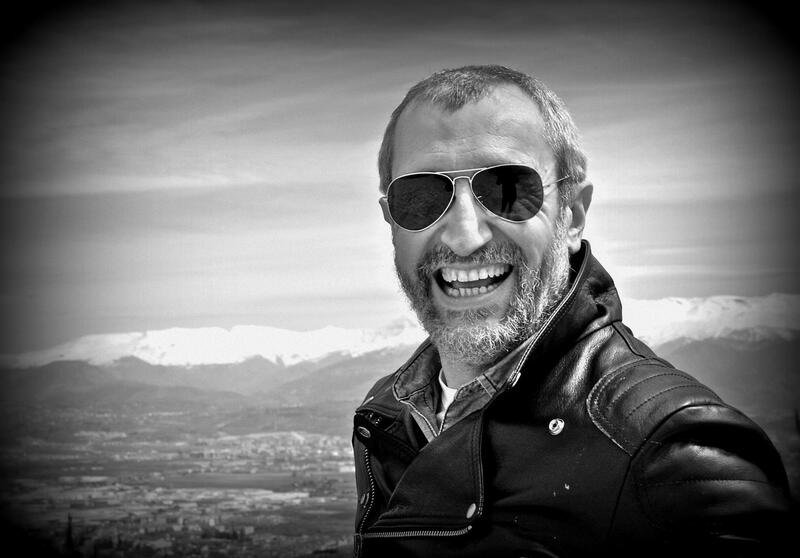 Manolo Vilches has a Degree in Physics (1990), a PhD in physical sciences (2009) and is a medical physics specialist (1991). He is co-editor of the blog desayunoconfotones.org. Vilches is one of those physicists whose passion for physics and science began in 1982 when he watched Carl Sagan’s Cosmos. Since then, science, as profession or just for fun, has given him some of the most rewarding moments of his life. Although he was born in Almería (1966), he was raised in Puerto Lumbreras, Murcia, He studied in Valencia, and now lives in Oviedo but he spent 27 years in Granada where my daughter is still living. As a famous song says, he’s not sure the place where he comes from, or the place where he goes, but he knows with whom he gets here and who are the people with which he wants to continue this journey. IRPS Bulletin, 28 (1), 9-13 (April 2014). (IRPS: International Radiation Physics Society). ICFA Beam Dynamics Panel Newsletter, No. 63, 9-15 (April 2014). (ICFA: International Committee for Future Accelerators).